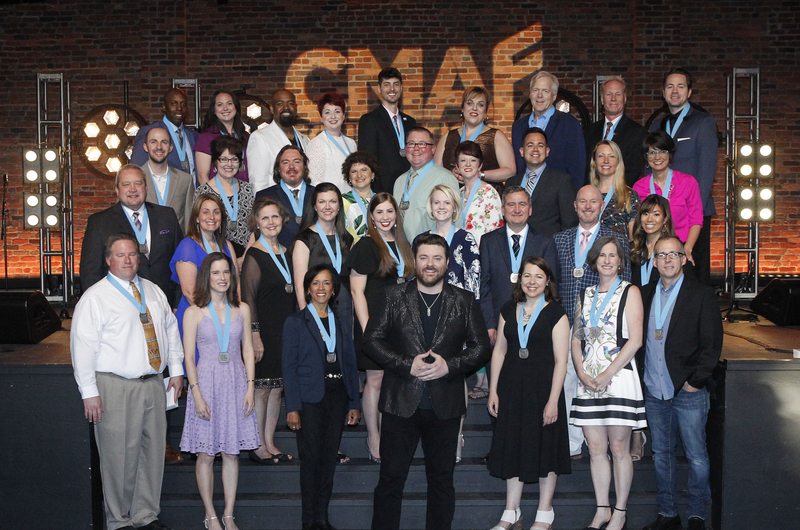 The CMA Foundation honored 34 music educators during its third annual CMA Music Teachers of Excellence ceremony Tuesday night (May 8) at Nashville’s Marathon Music Works. The invite-only event, hosted by CMA Foundation board member Chris Young, celebrated teachers from districts across the state of Tennessee as well as from Chicago, Cincinnati, Los Angeles and Seattle for their advocacy and commitment to music education. More than a dozen artists and celebrities attended the ceremony in addition to Nashville Mayor David Briley, Metro Nashville Public Schools Superintendent Shawn Joseph, CMA and CMA Foundation board members, industry leaders, and representatives from eight CMA Foundation beneficiary programs. In addition to Young, artists, songwriters and celebrities in attendance included Jimmie Allen, Craig Wayne Boyd, Kix Brooks, Max Camp, CB30, Adam Craig, Jacob Davis, Devin Dawson, Jerry Douglas, Lindsay Ell, David Fanning, Nicolle Galyon, Hunter Hayes, Kristi Hoopes, R&B trio SWV’s Taj Johnson-George, Tracy Lawrence, Steve Moakler, Eric Paslay, Walker McGuire, and Charlie Worsham. “I am honored as we celebrate 34 music teachers from across the state of Tennessee and beyond who have demonstrated excellence—not only in their classrooms, but in their communities, those who work tirelessly to help our young people develop a love for music,” said Sarah Trahern, CMA Chief Executive Officer. The CMA Foundation created the Music Teachers of Excellence program in 2016 in an effort to recognize the best and brightest music teachers from Nashville and beyond. Award recipients were selected because of their dedication to delivering a quality music program to their students and the impact they’ve had on their school community through music. The dedicated educators will each receive $5,000 from the CMA Foundation to not only support their classroom needs, but to support their professional development as well.